How terrible are these clowns? 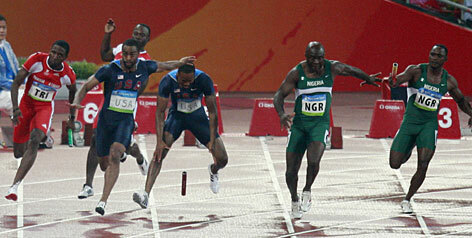 How do professional athlete's not practice the baton exchange before competing in the Olympics? It's just unacceptable and embarrassing. Enough said. Atleast we have some professional athlete's that take their profession seriously. Congrats Kerri and Misty! Yeah it's air-brushed....... but she's still hot! Anyway.......mens hoop better represent today or I will be blastin their asses on Monday too! Enjoy the weekend fellas and make sure you check back in for teasin T-bone this weekend. This page contains a single article from August 21, 2008 10:40 PM. The previous days article was CHICAGO BEARS PRESEASON PICK. The next days article was Bears Recap, Fantasy Flops, & MLB ATS.